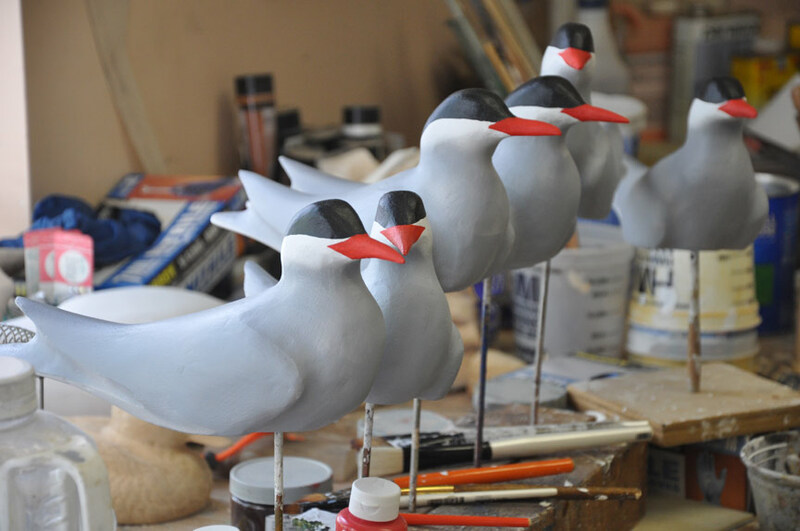 Arctic Terns require a different pattern than Common Terns. They are about 10% smaller overall and their primary feathers are more slender and don't extend out to the end of the tail. Ours are solid wood, sealed, and finished with acrylic color coats. The soft transition from gray to white on the cheek is achieved by airbrushing. These are based on details provided by Klaus Malling Olsen and Hans Larsson in Terns of Europe and North America, so it is fitting that the first group we carved went to an acquaintance of theirs in Sweden. They are bored to mount on pins set into the ground. Sad to say, but the automated shopping cart on this site has a bad habit of telling those from overseas that we can't ship our decoys there. NOT SO! Should you receive that message, just use this link to contact us and we will get right back to you with the shipping information.